The epidemiology of assaults resulting in stab injuries in young people is described in this study. A retrospective review of patients under 25 years at a major trauma centre in London between 2004 and 2014 was conducted, using demographic data and information on the time and geographical location of the assault, analysing 1,824 patients. Stab injuries rose sharply in late adolescence, before slowly declining. There were significant differences in the time and geographical location of assaults. With increasing age, assaults happened later in the day and were less often close to the home. Among children, a significantly large number of assaults occurred on school days between 4pm and 6pm, and within 5km of the home (the average distance between home and school in London). The authors suggest that the two-hour period directly after school represents an opportunity for targeted prevention in children. Vulliamy P, Faulkner M, Kirkwood G et al (2018) Temporal and geographic patterns of stab injuries in young people: a retrospective cohort study from a UK major trauma centre. BMJ Open. 8, 10, e023114. Are paediatric stabbings in London related to socioeconomic status? The link between area-level socio-economic deprivation and risk of paediatric stabbings is explored in this retrospective review of patients age 18 years and younger at a major trauma centre in west London between 2015 and 2017. Data were collected on gender, age, incident type and home postcode. Area-level socio-economic status was measured using the index of multiple deprivation (IMD), which scored areas on a ten-point scale where one represents the most deprived areas in England and ten the least. Among the 136 patients included in the analysis related to incident postcode, the average IMD incident location score was three. The IMD score and frequency were strongly negatively associated, suggesting that as social economic advantage increases, frequency of stabbings in a location decreases. For the 150 patients related to home postcode, the IMD score and frequency were also strongly negatively associated. The authors highlight the need for increased investment in social infrastructure to prevent paediatric stabbings in deprived areas. Lam C, Aylwin C, Khan M (2018) Are paediatric stabbings in London related to socioeconomic status? Trauma. doi: 10.1177/1460408618789967. Use of a mobile workshop involving simulation among young people at risk of criminal knife behaviour was evaluated. The simulation involved a three-scene patient journey about a young man stabbed in the abdomen, where a friend calls emergency services and the man attacked is attended by police and paramedics; this man undergoes emergency surgery; the surgeon then meets him and his mother to discuss recovery. The workshop was delivered on five separate occasions in London among 60 teenagers (age 13 to 19 years) from socially disadvantaged backgrounds. The evaluation considered the content and delivery of the workshops, and the educational and behavioural outcomes. For the first part, data included semi-structured interviews with five participants. The findings suggested the workshops provided a safe learning environment, the surgical silicon model proved memorable and the emotional aspects of the simulation were highly valued. In the second part of the evaluation, semi-structured interviews with eight participants were conducted immediately after the workshop and again at seven weeks. It found that participants remembered aspects of the taught content including: what they should say as a bystander when phoning emergency services, the physical and psychological consequences of a knife wound to the abdomen, and the wider consequences of knife crime. Evidence of behavioural change was varied. 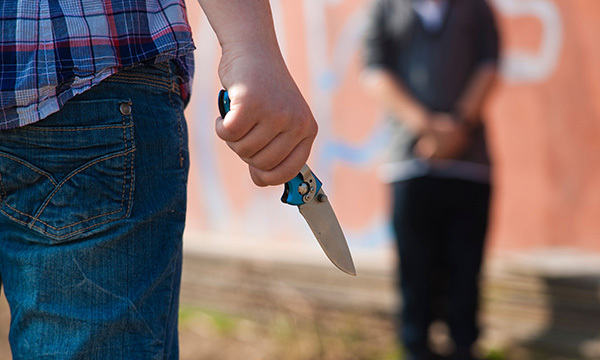 While behavioural outcomes were elusive, the mobile workshops involving simulation equipped teenagers with the knowledge to think twice about knives and what to do if involved as a bystander and a potential witness. Tribe H, Harris A, Kneebone R (2018) Life on a knife edge: using simulation to engage young people in issues surrounding knife crime. Advances in Simulation. 3, 20.